NORRISTOWN, PENN—Bill Cosby’s criminal retrial on sexual assault charges set to begin with jury selection on March 29 after Montgomery County, Pennsylvania Judge Steven O’Neill rejected the comedian’s request to have the charges against him dismissed. During pretrial hearings for the initial trial, which ended in a mistrial when jurors couldn’t reach a verdict, O’Neill declined prosecutors’ request to allow 13 accusers who, in recent years, have come forward with allegations similar to Constand’s claims. In his previous ruling, O’Neill allowed just one accuser. He said at the time that an individual’s history could not be admissible evidence that proves he committed a certain crime. 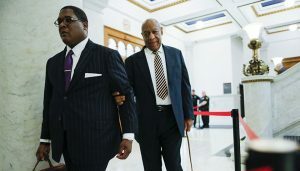 During the recent hearings that took place on last week, lawyers for both sides went after each other with prosecutors asking the judge to remove Cosby’s defense attorneys, because they accused the state of malicious prosecution. Before the hearings started, O’Neill expressed condolences to Cosby whose daughter, Ensa, died late last month from kidney failure at the age of 44. “Thank you, your honor,” Cosby said as he rose and bowed to the judge. Cosby spokesman Andrew Wyatt said Ensa had been “in bad shape” since last year. He said that her death came, as one of her sisters was cleared to donate a kidney. Wyatt said having a defense team led by Mesereau has afforded the Cosby family a bit of comfort. “Having Tom certainly allows Mr. and Mrs. Cosby to sleep at night,” Wyatt said. Jury selection is scheduled to begin Thursday, March 29 while the trial is on the calendar for Monday, April 2.